World leaders aren’t known to refer to themselves as “fakir” (ascetic) or “chowkidar” (watchman) or “pradhan sevak” (chief servant). Never did prominent leaders from the past – John F. Kennedy, Nikita Khrushchev, Winston Churchill, Charles de Gaulle – tried to garner self-pity, nor do the present ones – Donald Trump, Vladimir Putin, Angela Merkel, Theresa May – seem like they would make conscious efforts to gain sympathy from the people by projecting themselves in such roles. All of them were and are self-confident people – with their egos intact — but not megalomaniacs. Prime Minister Narendra Modi often describes himself as “fakir, chowkidar or pradhan sevak”. His die-hard supporters routinely point out that he has no family ties (he has his wife, mother, and brothers), and no dynastic succession and, therefore, cannot be corrupt! He has “successfully” projected himself as a “selfless sanyasi”, notwithstanding his expensive jackets and personal grooming. He has also mastered the art of playing the role of a victim! A victim surrounded by “corrupt Congress’ and social elite living in Lutyen’s Delhi. Psychologists say that this constant sense of victimhood and reference to the self is a reflection of megalomania, a mental disorder. What are the characteristics of such disorder? A person who is obsessed with power, who considers himself all-knowing, who has no patience for interaction or time for other’s suggestions and is pathologically egotist. Most of these attributes fit the personality of Narendra Modi, if one goes by various experiences narrated by senior leaders in the party and bureaucrats who deal with him on a regular basis. Journalists often interpret political behaviours through personality traits. Indira Gandhi’s personality and her decisions from the time of churning within the Congress to when the Emergency was imposed have been analysed and interpreted threadbare. Relatively speaking, Narendra Modi has not been brought to the psychoanalyst’s couch. While assessing Narendra Modi’s chances of becoming the Prime Minister once again, it would surely be helpful to analyse his personality traits. If Rahul Gandhi can be psychologically dissected, and declared as “not PM material”, why is Modi not put through psychographic tests? Many writers and political commentators have compared “Indira Gandhi’s authoritarianism” with Narendra Modi’s “autocratic and decisive style”. But none has gone far enough to prepare a psychological profile of Modi. He stormed onto the national stage in 2014 without having had his personality traits analysed. But as the polemics heat up on whether he would become the PM again, it would be worthwhile to do that now. In about four months, the Indian electorate would decide whether Modi is in the Prime Minister’s Office or in Parliament as the leader of opposition, or whether he has to choose between leading his party until the next elections or handing over the reins to someone else. I would not compare Donald Trump’s persona with Narendra Modi’s, but it is interesting to note that as many as 27 top psychiatrists, psychologists and mental health professionals have done detailed analysis of the President’s mental state, in the now famous book, “The Dangerous Case of Donald Trump”. Their unanimous conclusion is that President Trump’s mental health poses a “clear danger” to the nation and individual well-being. They have further argued that his mental health was affecting the mental health of the people of the United States! While that sounds like a very alarming scenario for India, it should not be ruled out as hypothesis. Quite a few colleagues and senior bureaucrats who have worked with Narendra Modi in Gujarat have given a lot of insight into his style — personal and governance. Their experience and observations must not be overlooked, particularly as the turning point in India’s electoral history is just a few months away. Take for instance, Narendra Modi’s announcement abolishing the Planning Commission in his very first Independence Day speech. It was without any prior discussion in the cabinet. Nor was his decision of demonetisation, which the cabinet learnt from the radio and TV broadcast, was discussed as all the ministers were brought into one room and were virtually locked in. He knows economics, foreign policy issues, defence strategies, security concerns, physics and chemistry, education-related problems, urban questions, sanitation and water management, Indian culture, Ganga and its legacy as well as climate change and so on. He addresses all subjects and their multiple dimensions in his monthly “Mann Ki Baat” or in his long lengthy monologues delivered all over the world, mainly to the Indian diaspora. He is indeed a miracle man! He never refers to any book, any literary classic, any theory, any historical detail, any context from the past on foreign relations. Many people who visit him say that they have been “astonished” by his range of knowledge and command of various subjects. They also mention that he has opinions on all these issues! Such an extraordinary person is a perfect case for psychoanalysis. If Indira Gandhi can be analysed for her alleged paranoia, Rahul Gandhi for his alleged “Pappu”-dom, Priyanka Gandhi for her so-called bi-polarity, one can certainly study the psycho-profile of a Man Who Knows Too Much! If everyone else can be on the couch of leading psychoanalysts, why not Narendra Modi? 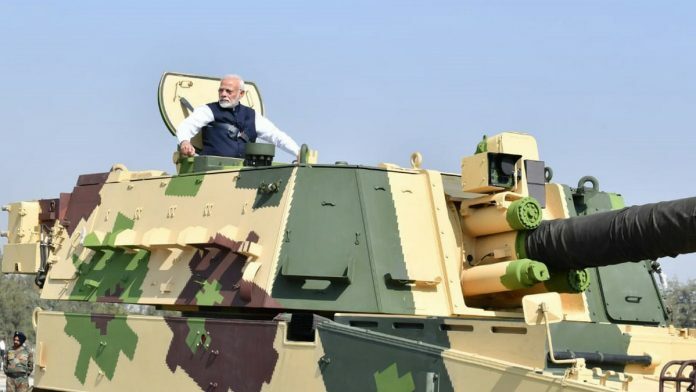 There are instances of Modi Sahab taking his security team to task when by chance they spoiled a good photo opportunity! All pomp and show for the great leader. Mr Modi may not have a family, but for his own sake, in this life, he desires a lot. I am not suggesting anything, but just for the sake of an argument, if the former fact can make him uncorrupted, the latter fact can surely make him corruptible. A man does not always want to build an empire for his family, sometimes he wants to build one for his own desire. Mr Modi surely is schizophrenic. Not everyone wants to be identified with great people. When he sits at Gandhi’s charkha or does not object to his photo being placed on the Khadi Gramodyog diary and calendar, he truly wants to be noticed as a modern-day Gandhi. When he sees his photo solo with Sardar Patel’s statute, he admits to Sardar’s great qualities and wants people to see him in Sardar’s mould. Similarly with Vivekananda; when Modi speaks to an interviewer with Vivekananda’s photo in the background, he wants people to identify him with the latter’s scholarship. When he mingles with school children after the 15th August speech at Red Fort, or guides them like a friend on how to tackle exam tensions, he does have somewhere at the back of his mind the image of children’s beloved Chacha Nehru. All these hint towards some very positive side of Mr Modi’s personality. His desire to be great by nobility. Yet, on the other side of the ledger is his monstrous disinterest in killings of the innocents when he knows full well that a stern and sincere warning from him will immediately end to mayhem; his total apathy to young girls and women’s humiliation every day; his display of mean and vindictive nature as regard to his political opponents like Kejriwal; his ruthless attack on a civilized India by attacking the very institutions that are the pillars of that civilized India; dismissal of Uttarakhand government which was later overruled by high court. Two strong sets of positive and negative qualities sit side by side in Mr Modi — our own Dr Jekyll and Mr Hyde! To be an elected leader of a Democracy but display the delusions of megalomania is another shock discovery in Mr Modi’s personality. I am talking of his handling of the Rafale case. In the same breath I must also add that what initially looked like a case of mere grandstanding is now turning out to be, in the light of revelations of PMO’s systematic and prolonged involvement in it, a well planned case of interference completely disregarding the set procedures. Whether it was done with national interest in mind or to benefit some one, or a group of persons materially is yet unclear. The suspicion is towards the latter, Anil Ambani being such an unlikely protagonist in the whole saga. I copy the following quote from this article: Their unanimous conclusion is that President Trump’s mental health poses a “clear danger” to the nation and individual well-being. They have further argued that his mental health was affecting the mental health of the people of the United States! This is said about President Trump. But here in India too we can see symptoms of this with respect to the Rafale case. Two aspects of this case, namely, the inclusion of Anil Ambani and reduction of the number from 126 to 36 are indefensible even to a blind man. Yet, we have a large number of our countrymen who still insist, like Mr Modi himself, that he is innocent! Has Mr Modi the magical power to muddle up people’s thinking? Dr. Jekyll or Mr Hyde, we have an interesting persona in our midst these days! You are right about his “solo attention” bit. Inauguration of a bridge somewhere in North East few months back, pooja at Sardar Patel statute at the time of inauguration, even while going round the memorial of Mr Vajpeyi — EVERYWHERE Modi ji wants to be seen alone in the frame. In the last example, Amit Shah and President Kovind too were there with Mr Modi. But the other two just stood there watching him as Mr Modi went around the tomb. Perhaps they knew that he doesn’t like to be accompanied by anyone in important photos!